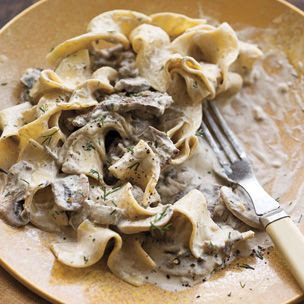 Love, love, love this Steak and Mushroom Stroganoff recipe from Williams-Sonoma’s Comfort Food: Warm, Homey, Rich and Hearty by Rick Rodgers. A 19th-century Russian classic, this Williams-Sonoma’ stroganoff recipe is sensational with it’s tender chunks of steak, sweet shallots, loads of sauteed mushrooms and an outrageously rich sour cream sauce. If you don’t already own this cookbook, I strongly recommend buying it. It costs $34.95 at Williams-Sonoma, but you can get it for about $25 at Abebooks, an online website for used, new, rare and out of print books. In this comfort food cookbook, there are lots of wonderful recipes worth trying such as blueberry pancakes, buttermilk fried chicken, mac ‘n’ cheese, and fresh peach cobbler with vanilla ice cream. I’ve made their French Toast with Caramelized Bananas, which was wonderful. Tonight instead of going out to eat (which is our Friday night norm), I made steak and mushroom stroganoff, because I had not cooked all week! I felt the need and want to cook. 🙂 Growing up, I don’t remember eating beef stroganoff, but now I will make it all the time. This recipe is very simple, especially the sauce, which is just sour cream and dill. My favorite part are the sliced mushrooms. They have so much flavor and combine so well with the steak, noodles, and sauce. (Sometimes I’ll substitute ground beef for steak). If you have a Central Market, you need to buy your meat from them. Their steaks are tender, juicy, and fresh, unlike Kroger or Tom Thumb. 1. Trim the steak of any surface fat. Cut the steak into slices 1/4 inch thick, then cut the slices into 2 inch lengths. Season with salt and pepper. 2. Bring a large pot of water to a boil over high heat. Add the egg noodles and cook according to the package directions until al dente. 3. While the noodles are cooking, brown the steak. In a large frying pan, heat the oil over medium-high heat until it shimmers. Add the steak in batches and cook, stirring frequently, until lightly browned, about 2 minutes per batch, adding more oil to the pan as needed. Transfer the beef to a plate. 4. When all the steak is cooked, add the mushrooms and 2 tablespoons of the butter to the frying pan and cook over medium-high heat, stirring frequently, until the mushrooms are lightly browned, about 6 minutes. Add the shallots and cook, stirring occasionally, until they soften, about 2 minutes. Remove from heat and stir in the steak, sour cream, and 1 tablespoon of dill. Return to medium heat and simmer, stirring constantly, until the sour cream is heated through, about 1 minute. Do not allow to boil. 5. When the noodles are ready, drain them and return to the cooking pot. Add the remaining 1 tablespoon butter and toss to coat. Divide the noodles among dinner plates and top each serving with the steak and sauce. Sprinkle with dill and serve. 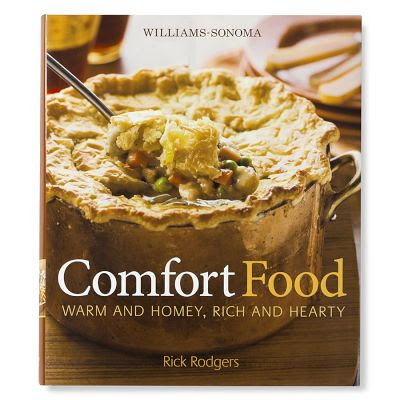 Recipe from: Williams-Sonoma’s Comfort Food: Warm, Homey, Rich and Hearty by Rick Rodgers.